Growing up, big sisters walk a fine line between setting the good example that most are told is their responsibility and becoming a bossy mother substitute while they are still children themselves. Once they’ve heard that, ” you are the oldest, you have to set the example ” speech enough, they can become rooted in a role model position that morphs easily over time into a caretaker role that can be difficult to give up. Having a childhood where you are told you need to be the responsible one can create a life long struggle between trying to live your life as you desire and trying to ensure everyone around you is okay. Children need a chance to be children, even those born first. Can you tell where I am in the birth order? I am the eldest of four girls. Being prepared for worst possible outcomes has been a by-product of the big sister syndrome for me. When I was about six, I remember hearing on the news or in adult conversation that a tornado was possible and the impact it might have on the city where I lived with my mother and only sister at the time. For some reason, I decided that our mother was not on top of things enough to suit me so I took it into my own head that we needed a plan of action complete with an escape route and a place to meet should we be separated by the storm. Decision made and because Margaret was only about four, and I packed our little kiddie suitcases with a few things I thought we might need and put it all by the front door sometime after our mother had gone to bed. I remember being very surprised the next morning that we had not had to flee in the night and I can’t remember what my mother might have said when seeing the important pile by the door. We moved from the house in the photograph sometime before my seventh birthday and years later I went back to see it. After a quick look at the front of the still unremarkable red brick, ranch-style house, I walked past the carport and went around the backyard to see the “safe” place I had planned to lead my little sister in the event of a tornado. The designated place was not such a good pick after all as I had chosen a concrete pipe that while large enough to hold us both, would have been filled with water very quickly as it emptied groundwater from the neighborhood into a depression that ended behind our house. It is funny the things you remember and what inspires them. 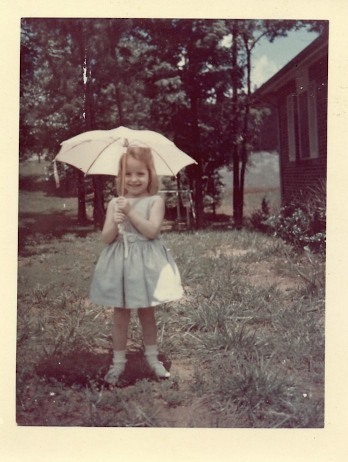 My sister Margaret is holding her umbrella on a day that appears sunny and bright. Some people might say … “oh look, she’s showing off her umbrella” because it’s not raining. I see it and think about the natural disaster I was so worried about while the real challenges in our young lives were still to come. John in his easy-going way suggested something much less dramatic might hold us up while I laughingly tried to attribute my worst case scenario thinking to my creative writer’s mind while really knowing that it’s just me planning for the worst, while hoping for the best. Margaret’s response to my over planning for an unlikely situation was to say that in the event of our hospitalization, she was still going to see London and Paris rather than hang out at the hospital with us. Spoken like a true younger sister … seriously, Margaret has morphed into a planner with a keen sense of preparedness all her own so the best way to ensure a good visit will be for me to remember that she’s grown and not such a ” little ” sister anymore. We haven’t traveled together or spent more than two weeks in the same space since we were twelve and fourteen so it ought to be an adventure in many ways. As we were going over her what to pack list I started to tell her that she did not need an umbrella as we had plenty, but she popped a nice striped one up for me to see on camera. Having seen the raincoat she’s bringing as well, I can rest assured that not only is she able to plan for changes in weather without her big sister’s help, but she will be fashionable on the city streets with her color coordinated coat and brolly. Given what I had planned to wear, it might be time to let her set the example for a while.